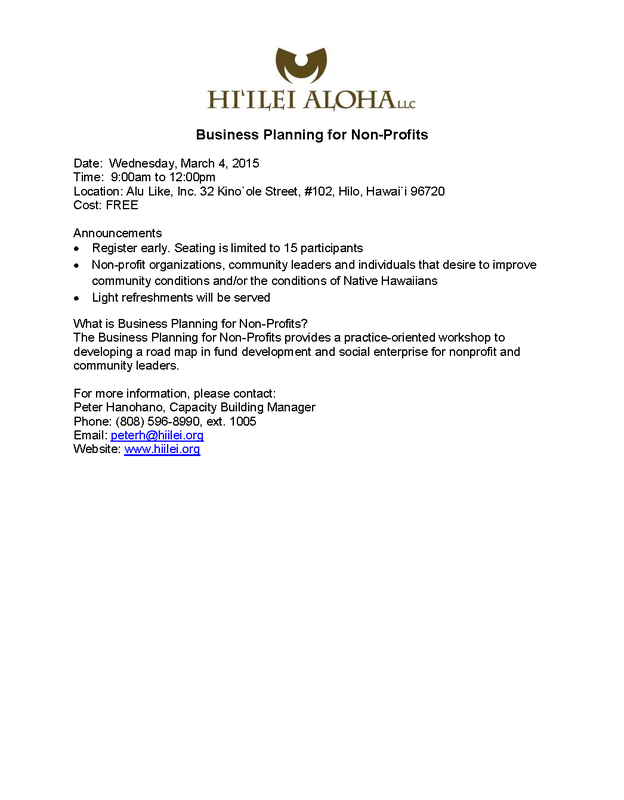 Economic Sustainability « Ka'u Rural Health Community Association, Inc.
To assist the communities we serve, Hiilei Aloha, LLC and Alu Like, Inc. are collaborating to bring Business Planning for Non-Profits in Hilo. This FREE one day event will occur on March 4, 2015 from 9:00 a.m. – 12:00 noon. Seating is limited to 15 people. Registration forms need to be received before/on March 2, 2015. Click on the links for more information or to print and submit your registration. This entry was posted in Economic Sustainability, Education, IRS 501 C (3) Non Profit Organization, Opportunities, Partnerships & Programs. WASHINGTON, D.C. —Today the Consumer Financial Protection Bureau (CFPB) issued a report on payday and deposit advance loans finding that for many consumers these products lead to a cycle of indebtedness. Loose lending standards, high costs, and risky loan structures may contribute to the sustained use of these products which can trap borrowers in debt. The report found that payday loans and the deposit advance loans offered by a small but growing number of banks and other depository institutions are generally similar in structure, purpose, and the consumer protection concerns they raise. Both are typically described as a way to bridge a cash flow shortage between paychecks or other income. They offer quick and easy accessibility, especially for consumers who may not qualify for other credit. The loans generally have three features: they are small-dollar amounts; borrowers must repay them quickly; and they require that a borrower repay the full amount or give lenders access to repayment through a claim on the borrower’s deposit account. The CFPB study is one of the most comprehensive ever undertaken on the market. It looked at a 12-month period with more than 15 million storefront payday loans and data from multiple depository institutions that offer deposit advance products. The report found many consumers repeatedly roll over their payday and deposit advance loans or take out additional loans; often a short time after the previous one was repaid. This means that a sizable share of consumers end up in cycles of repeated borrowing and incur significant costs over time. The study also confirmed that these loans are quite expensive and not suitable for sustained use. Specifically, the study found limited underwriting and the single payment structure of the loans may contribute to trapping consumers in debt. Deposit Advance: Depository institutions have various eligibility rules for their customers, who generally already have checking accounts with them. The borrower authorizes the bank to claim repayment as soon as the next qualifying electronic deposit is received. Typically, though, a customer’s ability to repay the loan outside of other debts and ordinary living expenses is not taken into account. Deposit Advance: There is not a fixed due date with a deposit advance. Instead, the bank will repay itself from the next qualifying electronic deposit into the borrower’s account. The report finds that deposit advance “episodes,” which may include multiple advances, have a median duration of 12 days. Deposit Advance: Fees generally are about $10 per $100 borrowed. For a deposit advance with a $10 fee per $100 borrowed on a 12-day loan, for example, the APR would be 304 percent. Deposit Advance: More than half of all users borrow more than $3,000 per year while 14 percent borrow more than $9,000 per year. These borrowers typically have an outstanding balance at least 9 months of the year and typically are indebted more than 40 percent of the year. And while these products are sometimes described as a way to avoid the high cost of overdraft fees, 65 percent of deposit advance users incur such fees. The heaviest deposit advance borrowers accrue the most overdraft fees. The CFPB has authority to oversee the payday loan market. It began its supervision of payday lenders in January 2012. The CFPB also has authority to examine the deposit advance loans at the banks and credit unions it supervises, which are insured depository institutions and credit unions, and their affiliates, that have more than $10 billion in assets. Today’s report will help educate regulators and consumers about how the industry works and provide market participants with a clear statement of CFPB concerns. While today’s study looked at storefront payday lenders, the CFPB will continue to analyze the growing online presence of such businesses. The Bureau is also looking at bank and credit union deposit account overdraft programs which provide short-term, small-dollar, immediate access credit services. The CFPB will publish initial results from this overdraft study later this spring. To help educate consumers about payday and deposit advance loans, today the CFPB updated its Ask CFPB web tool to assist consumers with their financial questions about these products. This entry was posted in Economic Sustainability, News, Partnerships & Programs. After years of collective work by the Ho’owaiwai Network and its supporters, the Governor recently signed HB 868 into law, which eliminates the asset test for recipients of benefits under the Temporary Assistance for Needy Families (TANF) program! We are only the 7th state to do so! Stories from your own organizations around the efforts you have put in to ensure the passing of this legislation. 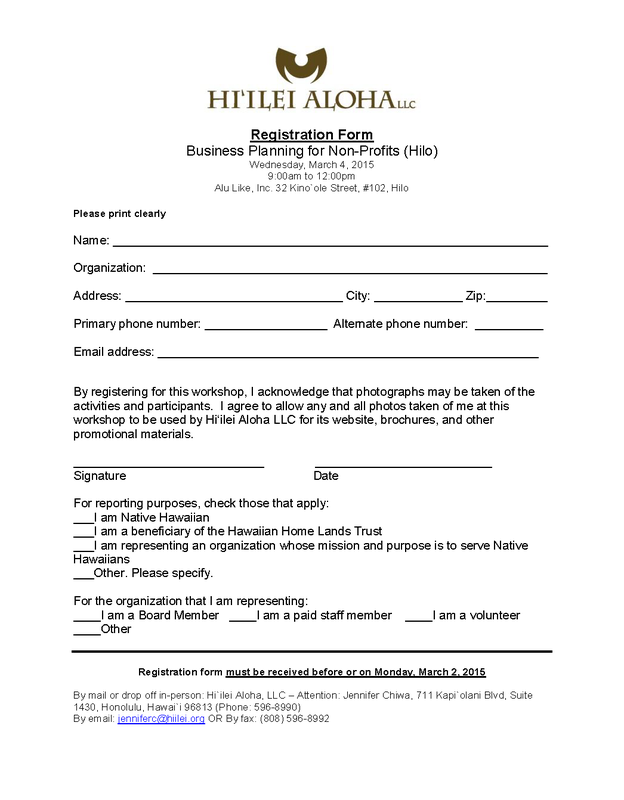 If you are interested, please contact Brent Kakesako, Chief Operating Officer of the Hawai’i Alliance for Community-Based Economic Development (HACBED) via email (bkakesako@hacbed.org) or phone (808-550-2661) by Friday, May 10. Mahalo for all of your efforts to build assets of families across Hawai’i to increase their self-sufficiency and control over their daily lives! This entry was posted in Economic Sustainability, News, Opportunities, Partnerships & Programs. In the last few years, there have been major changes in the way consumers handle their banking and other financial transactions. As a result of new laws and regulations and advancements in technology, it’s important for consumers to have as much information as possible to effectively manage their money and avoid scams. That’s why, in observance of National Consumer Protection Week (NCPW) 2013, the FDIC has compiled a list of some of the most popular articles from its quarterly newsletter, FDIC Consumer News. The list can be found at www.fdic.gov/ncpw. Tips for managing a mortgage. The goal of FDIC Consumer News is to deliver timely, reliable and innovative tips and information about financial matters, free of charge. To find current and past issues of FDIC Consumer News, visit www.fdic.gov/consumernews or request paper copies by contacting the FDIC’s Public Information Center toll-free at 1-877-275-3342, by e-mail to publicinfo@fdic.gov, or by writing to the FDIC Public Information Center, 3501 North Fairfax Drive, Room E-1002, Arlington, VA 22226. Also in connection with NCPW 2013, which is March 3-9, www.fdic.gov/ncpw features other FDIC resources for consumers on a variety of topics. Among them are “EDIE,” the FDIC’s online calculator that assists consumers and businesses in determining their deposit insurance coverage; BankFind, the FDIC’s online directory of insured institutions, including banks that changed names or no longer exist; and Money Smart, a financial education curriculum concentrating on the development of consumers’ financial skills and positive banking relationships. “The FDIC is proud to be a partner in this year’s National Consumer Protection Week campaign and to support efforts to help people become informed consumers,” Chairman Gruenberg added. Congress created the Federal Deposit Insurance Corporation in 1933 to restore public confidence in the nation’s banking system. The FDIC insures deposits at the nation’s 7,083 banks and savings associations, and it promotes the safety and soundness of these institutions by identifying, monitoring and addressing risks to which they are exposed. The FDIC receives no federal tax dollars — insured financial institutions fund its operations. As part of National Consumer Protection Week 2013, the FDIC provides a list of some of the most popular articles from our quarterly newsletter, FDIC Consumer News (www.fdic.gov/consumernews). Take a look at the topics that many consumers are interested in (based in large part on “hits” on the FDIC’s Web site) and read the articles for helpful information and tips. There are good reasons to hang on to financial documents such as receipts, bank statements and credit card bills, but how long should you keep them? Internet commerce is fast and convenient, but it pays to take precautions. If you’ve found records of an old bank account, certificate of deposit (CD) or safe deposit box, here are tips to help you research and perhaps recover something valuable. Your credit report plays a large role in determining whether you’ll be approved for a loan, insurance or an apartment. So, it’s important to know what’s on your credit reports and how to rebuild your credit history after a financial setback. These CDs have the potential to earn more than traditional, fixed-rate CDs, but there are questions you should ask before you purchase one. The cost of higher education continues to go up, as does the debt students and caregivers often take on to finance it. Here are tips to avoid debt overload. What’s the Right Account for Your Everyday Banking Needs? Take this self-test to help you decide which bank account is best for you. An auto loan is a big expense for most people, so research your options before committing to a loan for a car purchase. Purchasing a home is a huge financial undertaking, so it’s important to carefully manage your mortgage. Here are some tips. This entry was posted in Economic Sustainability, News. The short article below helps explain why eliminating asset limits is a good idea. There are many different types of poverty, but the Asset Opportunity Unit at the Shriver Center focuses on asset poverty. Asset poverty means having insufficient funds to meet one’s needs for three months if income were to disappear for those three months. Focusing on asset poverty is important because assets are the building blocks for economic mobility and financial stability. While income poverty looks at whether people have enough to get by, asset poverty looks at whether people have enough to get ahead. One way to measure the asset poverty level of a family of four, for example, is to multiply the Federal Poverty Level (FPL) by three months. Based on this calculation, an Illinois family of four would need $5,762.50 in savings to live for three months if they had no other source of income. Putting aside whether the current FPL is a sufficient measure of poverty, the question is whether most families, let alone low-income families, have even this much set aside. For low-income families receiving public benefits the answer is likely no. This is because asset limits in public benefit programs prevent such families from building a level of resources necessary for future needs. For instance, in Illinois, the asset limit for Temporary Assistance to Needy Families (TANF) is $2,000. Thus, if a family has more than $2,000 in savings, they are not eligible for TANF. In other words, Illinois’s TANF asset limit is only about one third of what a family would need to stay above the asset poverty level. Given such archaic limits, it is no wonder that families remain in poverty and reliant on public benefit programs. For years, advocates have argued that states should either eliminate their public programs’ asset limits entirely or, at a minimum, increase them to limits more reflective of today’s economic realities. As advocates correctly note, asset limits are a relic of entitlement program policies that no longer exist. Cash welfare programs, for example, now focus on quickly moving individuals and families to self-sufficiency, rather than allowing them to receive benefits indefinitely. Since personal savings and assets are precisely the kinds of resources that allow people to move off public benefit programs, continuing to utilize asset limits runs counter to this policy. Nevertheless, states have been reluctant to reform asset limits. Although most states have eliminated asset limits in the Supplemental Nutrition Assistance Program (SNAP), and some states have eliminated them in Medicaid, the majority of states still have them in TANF. Most often, fear about increased numbers of people who have significant assets enrolling in public benefit programs is given as a reason for not changing such limits. Yet, a recent study from the New America Foundation shows that in states where asset limits have been eliminated no such increases have occurred. Moreover, the study shows that eliminating asset limits actually reduces administrative costs and time per cases, which allows caseworkers to take on more cases, without increasing workload or administrative costs. The report, which analyzed the results of interviews and surveys of public benefit administrators in eight states, confirmed previous research that found that most applicants to SNAP and TANF have very few assets anyway and that eliminating asset tests would not significantly increase eligibility. In fact, currently in the majority of states studied very few families were denied program participation due to excess assets anyway. In Idaho, only 2.2% of SNAP application denials were due to excess assets. Thus, an overwhelming increase in cases is unlikely. This is true despite widespread belief that eliminating asset tests will allow wealthy individuals to “game” the system. The report also noted that eliminating asset limits reduces administrative costs, and the fiscal benefits to the state can outweigh any costs incurred. In Iowa, for instance, direct state costs for eliminating asset limits in its SNAP program were estimated at $702,202, but the overall benefit to the state would be $12.3 million from additional SNAP benefits and increased state employment. Oklahoma determined that eliminating the Medicaid asset limit in 1997 saved approximately $1 million in administrative costs. The study provides powerful data that advocates can use to convince policy makers that their perceptions about the benefits of asset limits are incorrect. Additionally, these data support advocates’ assertions that, despite what states such as Pennsylvania and Michigan apparently believed when they reinstated asset limits in their public benefit programs, eliminating asset limits is not only necessary for the economic stability of low-income families, but also cost effective for. As the economy begins to improve, now is not the time for states to regress in important policy reforms that will help families become financially self-sufficient. This blog post was coauthored by Alex Hoffman. This entry was posted in Economic Sustainability.